A pod of orcas was spotted making its way across Vancouver's inner harbour Tuesday afternoon. 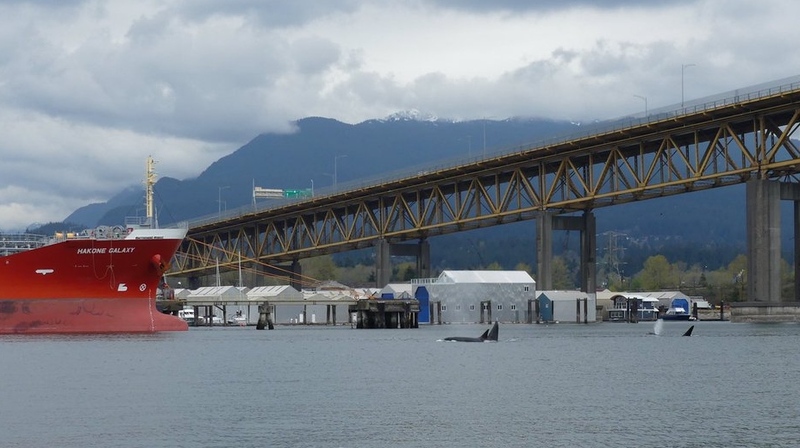 The Vancouver Police Department's Marine Unit posted several photos to social media, showing the whales heading in to the harbour from under the Ironworkers Memorial Bridge, connecting Vancouver to the North Shore. Video posted to Twitter shows at least two of the orcas diving and circling beneath the Lions Gate Bridge in Stanley Park. It's not the first time a whale has ended up in Vancouver waters. In 2016, a pod of orcas was spotted near Coal Harbour. Three adult whales and a juvenile were seen frolicking around the harbour then out past the Lions Gate Bridge in the Burrard Inlet. One of the orcas back then was identified by the Vancouver Aquarium as a male Bigg's (or transient) killer whale. Other whales have also been spotted hanging out near Vancouver. A grey whale made its way into False Creek in 2010, ending up near Science World. Crowds gathered along the shoreline to watch it make its way around the area, before leaving back the way it came. More recently, a group of killer whales ended up in Victoria's Inner Harbour in June. The group of four or five orcas, including a large male and what appeared to be a calf, spent about an hour touring the harbour, bringing vessel traffic to a halt and delaying floatplane activity.